I will be at Eastercon from the 19th to 22nd of April and at the convention, I will be involved in a few different items. Firstly, I will be doing an author reading on Friday evening at 5:45. I will be doing readings from Wolf Unleashed and Shadows of Tomorrow, maybe more if I have time. It will be a shared session with other authors David Allen and Ian Creasey. On Saturday, I will be doing a book signing for Wolf Unleashed at the Guardbridge Books table in the dealers’ room. This will be at 1pm on the Saturday until 2pm. On Sunday, I am in two panels. One is at 10:15 in Discovery 1 and is on the subject: Beyond Studio Ghibli. We will be talking about our favourite animes, making recommendations, and offering ideas for where to find new anime to watch. Nothing remotely to do with my books, but it should be a really interesting one. The second Sunday panel is at 5:45 in Bleriot. It’s on queerbaiting in mass market genre films, and I’m really looking forward to this panel. I’ve done LGBTQ+ representation panels with one of the other panelists before and we can usually have some good discussions. I think this is going to be a really interesting subject to go into. I’m expecting this to be a lot of fun. I spent most of yesterday at Bath Comic Con, which was a relatively small, one-day con. It wasn’t a great day for sales. It seemed like a lot of other people in the dealers room were struggling, and I wasn’t helped by being tucked into an awkward spot in the corner. Still, despite the challenges, I met some nice people and sold a few books. I talked to another author who had a few books for sale, including one about a private detective fighting the mummy on the Titanic, which sounds like a lot of fun. I may have to give that one a try sometime. 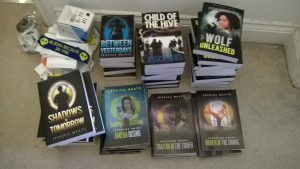 I also talked to a woman who works in a library in Bristol about the possibility of stocking some of my books, and a couple of creative writing students who were interested in the process of getting published. 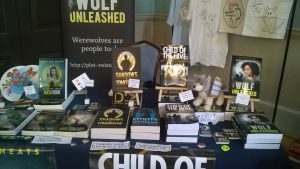 In this video, I offer some advice for selling books at sci-fi and fantasy conventions, a lot of which is also applicable to book fairs, Christmas fairs, village fetes, and anywhere else you might get a table for a few hours to sell your books. There’s some general advice and tips from my experience. I’d hope some of it, like being nice to people, would be obvious, but it doesn’t hurt to say it. In convention news, I will be at Bath Comic Con, on 23rd March 2019. It’s in the Bath Assembly Rooms and I will have a table in the ball room if anyone wants to come along and talk to me about books, writing, or fandom in general. A little while ago, I came across the Queer Book List website, https://queerbooklist.com/. This is a website that provides educational resources about queer literature as well as a list of queer young adult novels arranged by date, so you can look back over the history of queer literature. There is also a section for queer adult books, marked as “coming soon”. I thought it would be nice to talk to the creator of the site, Chris Morabito, about this project. Please start by telling us a little bit about yourself. I’m currently in my second year of grad school, where I am pursuing a Ph.D in English. My research is largely concerned with queer literacy, the ways in which queer characters, particularly adolescents, use reading and writing as a means of both discovering and expressing their gender and sexual identities. The motivation for this research stems from my own coming out experience in high school, where I did not really feel that I had people to turn to, so I turned to books instead. I’m a certified high school English teacher in the state of New York, but I’m currently teaching introductory English classes at my local public university. Ultimately, my goal is to obtain my Ph.D and teach a variety of queer lit courses. I would also love to find a way to get involved in schools, holding professional development workshops for teachers, events for students, and working on curriculum design. All of these areas combine on my website. And please introduce your Queer Book List project. Queer Book List is a lot of different things, and it is constantly evolving. At its core, it is exactly as the name indicates — a list of books that contain queer content. The largest part of the project is a list of queer young adult books organized by year of publication. As I read the books, I also post reviews where I provide a brief overview of the book and reflect on the way in which it reflects queer life. Since I started the project last January, I have expanded it in a number of ways. The first major expansion took the form of a resources tab, where I post anything that I think might be of use to people — such as sample lesson plans, how-to guides, and workshops (More on this below). More recently, I have also included a blog page so that I can share more experiential content, such as reflections on my own queer adolescence and on my teaching practices. Ultimately, I really just want Queer Book List to be a resource for queer adolescents, educators, and anyone else really, to turn to in order to learn more about queer literature and maybe even queerness more generally. What sort of educational resources are available on your site? If you visit the resources tab of queerbooklist.com, you will find a variety of resources for all kinds of educators. I have created a number of high school lesson plans for various queer young adult books. The lesson plans incorporate common core standards and include text analysis as well as writing prompts. Accompanying the lesson plans is also a rationale that will hopefully help convince teachers to use these or other similar texts, or that teachers can show to principals to justify teaching these texts. I have also created a sample syllabus for a college course using the same young adult texts that I wrote the lesson plans for. There are How-to guides, where I offer suggestions for how to make a classroom more inclusive and some criteria that I think are important in selecting a queer book to teach if you are only going to teach one. The final type of resource that I have on Queer Book List is a workshop that I recommend teachers use before going into any unit with queer content, as it serves as an introduction to terminology and sociopolitical issues. All of these resources are open for anyone to use and modify to better fit their specific needs. What made you decide to start this project? During the first semester of my Ph.D. program, I took a course on children’s and young adult literature. It was during this course that I began to do the research that started Queer Book List. While doing research for an assignment, I realized just how few resources there are out there cataloging queer young adult literature. Knowing that I would need to know a lot about these books for my dissertation, I started trying to read and take notes on as many books as I could find. The idea for Queer Book List simply came from the realization that, since I was already doing this work, I should share it with other people who might benefit from it. Since then, I have continually tried to think of other resources that I believe would be useful for people to find. Why does queer representation matter to you? On a personal level, queer representation matters to me because I had very little of it to turn to when I was working towards understanding my sexual identity and coming out. I remember desperately seeking out queer representation wherever I could find it. I began reading queer subplots into everything that I read because I was so desperate to find myself reflected in the books I was reading — even before I knew that was what I was doing and/or looking for. It was not that these resources did not exist, the young adult page on Queer Book List proves that they did, but that I could not find them. That’s why, when I did find them, I was compelled to share what I found. I know, however, that I was lucky. I had teachers that I could open up to and friends and family to support me — even if they couldn’t understand exactly what it was that I was going through. It is true that there are more mainstream representations of queerness than ever before, but it also remains true that these are not accessible to all, especially for those who cannot access these resources openly. Moreover, queer representation is not only something for queer people. It is something that everyone should be exposed to, because queer people exist everywhere, if not always openly, and this is something that everyone should be aware of. Queer representation is about exposure; it is both about learning of the self and learning of others, and that is why it is so important. Do you have any criteria for deciding what books should go on your young adult book list? This is a really interesting question, because it is something that I am still struggling to figure out. What makes a queer young adult book a queer young adult book? Does the character have to be openly queer (at least to themselves)? Does the queer character (open or otherwise) have to be the main protagonist? If you compare the second half of the 20th century to this current first half of the 21st century, the difference between the number of QYA publications is quite stark. During the three decades from 1969 to 1999, no more than thirteen books with any form of queer content were published in a single year, and in fact, the number was often quite lower. Because these numbers were so small, and the need for these books was so great, excluding texts for any reason would have been counterproductive. Now, however, with more QYA books published in 2018 than the first two decades of QYA combined, narrowing down seems to make more sense. I try to select books where queerness is important to the narrative, either because the protagonist or another main character is queer, or if queerness seems to drive the plot in some way. A gay background character would not be enough of a reason to include a book on my list. Typically books make the list when I find some mention of them being queer. Once I get around to reading the book, I will better gauge if it belongs on the list and review it. I know that this is not a perfect system, but it is a place to start while I work on creating a better one. What are your plans for the project moving forward? Moving forward, my main goal is to just keep doing what I’m already doing. As a grad student who is also teaching and tutoring part time, I never feel like I have enough time to even keep up with what is already on the site. I have a pile of books that I have already read but still need to review and post. As of writing this, it is 2019, but my list of queer young adult books is still in 2018, and there are many years where information is incomplete or missing entirely. My ideal next step for Queer Book List would be to create some sort of online book club. I would love to, for example, select a book each month and create a space where people can come together and share their ideas about the book or anything else. I don’t think Queer Book List has enough of a following quite yet to make this idea work, but I am hopeful for the future. Other than that, who knows.(?) The project has already expanded in a number of ways that I could not have predicted a year ago, so I’m excited to see what the future brings to the site. Is there anything people can do to assist this project? Right now, the biggest way people can help out is by providing me with feedback: what is working well, what can I improve, what would you like to see. I would also greatly appreciate book recommendations, since it is incredibly difficult to track them all down. Of course, the easiest way to assist this project is simply to share it with everyone you know, especially educators. This is a large project and one that I never feel like I have enough time to fully work on, so I have considered bringing on other people to assist with the site, but I’m not really sure how I would go about this and if I am ready to relinquish complete control over the project. That being said, if you are interested in getting involved or assisting in any way that I mentioned or any way that I have not, please feel free to contact me at Queerbooklist@outlook.com and we can discuss the possibility further. The easiest way to find out more is to follow me on social media. You can find my Facebook page by searching for Queer Book List. My Twitter handle is @Queerbooklist and Instagram is @Queer_Booklist. My Instagram seems to have the most interaction, and therefore I am most active on it, but I try to share on all three whenever there is an update on the website. If there is something specific that you are interested in finding out or learning more about, please feel free to email me at queerbooklist@outlook.com. I’ve done a number of author interviews on this blog, but with this video I was trying something different and creating a video interview for my new channel. As with trying anything new, there were some technical issues, but I know what I need to do next time to get something a bit better. The new channel has a bit of a learning curve and if you have other suggestions for how to improve, I’m keen to hear them. So here’s my interview with B C Matthews, whose book Riptide I have reviewed in a previous post. I’ve also written a review of the other book we discuss in this interview: Acheiropoieta.